With the help of this NSF to MBOX Converter, one can export NSF emails to MBOX format without any hassle. 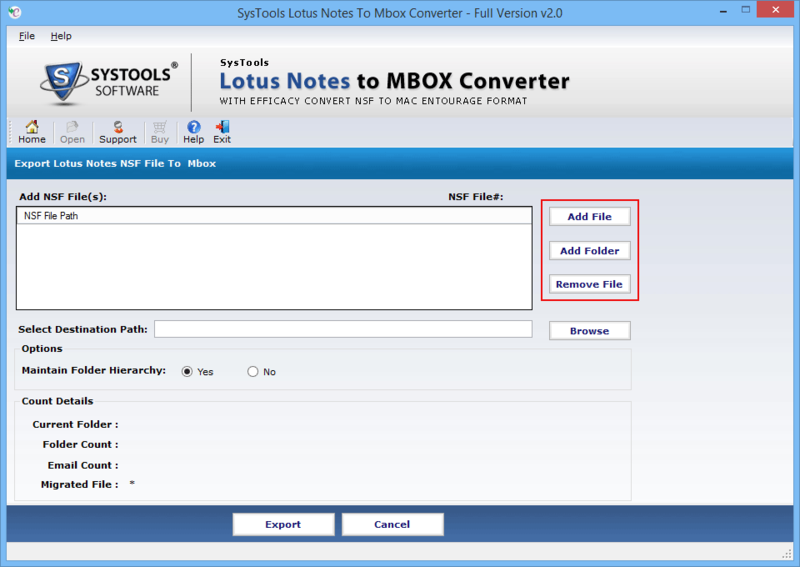 However, if a user wants, then he/she can convert Lotus Notes NSF to MBOX format in batch also. The tool provides an option to add folder that contains multiple NSF files in it and export all of them to MBOX format. The Lotus Notes to MBOX converter is designed in such manner that while exporting NSF to MBOX format it preserves the folder structure. Moreover, this is an optional feature for the user, which needs to checked while conversion to maintain folder hierarchy. In addition, the tool does not compromise folder structure by default. Another impressive feature about the software is that it preserves the meta properties of the Lotus Notes emails. For example, too, cc, bcc, email ids, sent date, etc all are keep intact as original by the software after NSF to MBOX conversion. Apart from all this, the IBM Notes to MBOX Converter make sure it does not make any changes to the original formatting of the email along with the attachments. 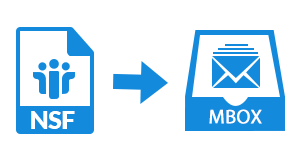 When the NSF to MBOX Exporter begins the conversion process, it will generate a small summary of the conversion process. This summary contains details such as name of current folder, number of folders exported, count of email and the name of resultant file. This will help in estimating the total time required to complete the process. 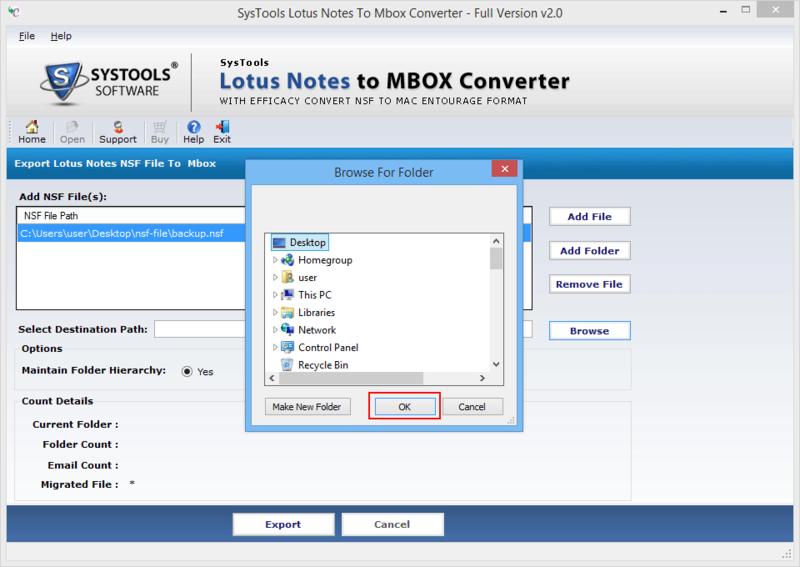 While migration the Lotus Notes to MBOX converter provides users an option to save the migrated file at any desired location. In addition, if a user wants, then he can create a new folder also directly from the tool panel to save the MBOX file into it. 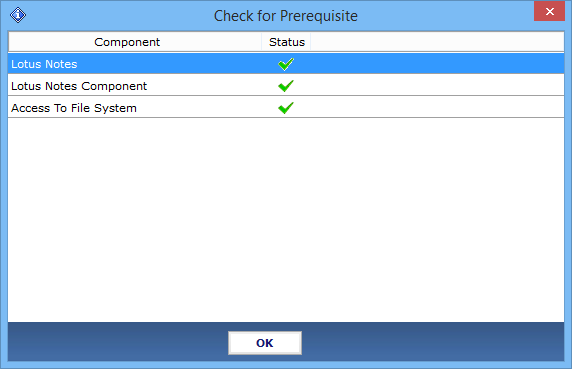 Apart from this, a user can access this output file in any MBOX supported application without any hassle. A user can easily run this IBM Notes to MBOX Converter software with Lotus Notes version Lo 9.0, 8.5, 8.0, 7.0, 6.5 & 5.0. In addition, it is easy to access the converted MBOX files in application such as Mac Mail, Eudora, SeaMonkey, The Bat!, Mozilla Thunderbird, etc. Is there any NSF file size limitation imposed by the Lotus Notes to MBOX Converter? No, the tool does not has file size limitation. It exports any size NSF file to MBOX format without any issue. Does the tool maintain the integrity of NSF file data after conversion? Yes, the application maintains data integrity even after NSF File to MBOX conversion. Can I export multiple NSF files to MBOX format in bulk using this software? 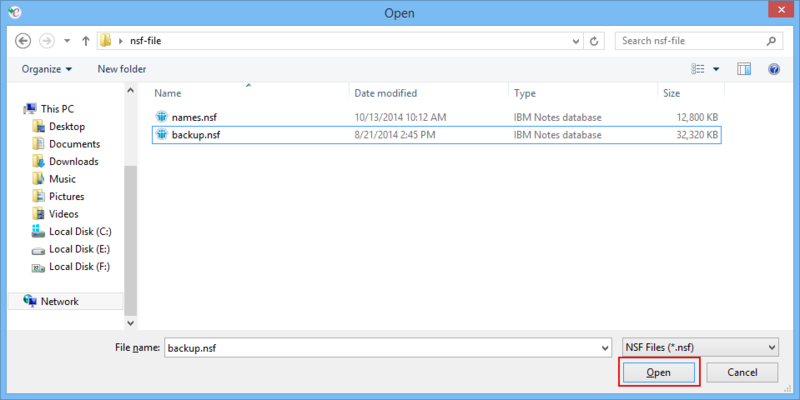 Yes, you can easily convert multiple NSF files to MBOX format using IBM Notes to MBOX Converter. To do this, you just need to choose a folder that contains multiple NSF files and the tool will export all of them simultaneously. Does the software convert attachments also associated with emails in NSF file? Yes, the tool is capable enough that it export attachments also along with emails from NSF file to MBOX format. Is it necessary to have Lotus Notes application installed on the local machine to perform conversion? Yes, to export lotus notes to thunderbird MBOX Format, one must have Lotus Notes 9.0 or below version installed on the system. First of all, download & install NSF to MBOX converter on the local machine. This software will check for required perquisites, click on OK.
Add File: To add one Lotus Notes NSF file at a time. 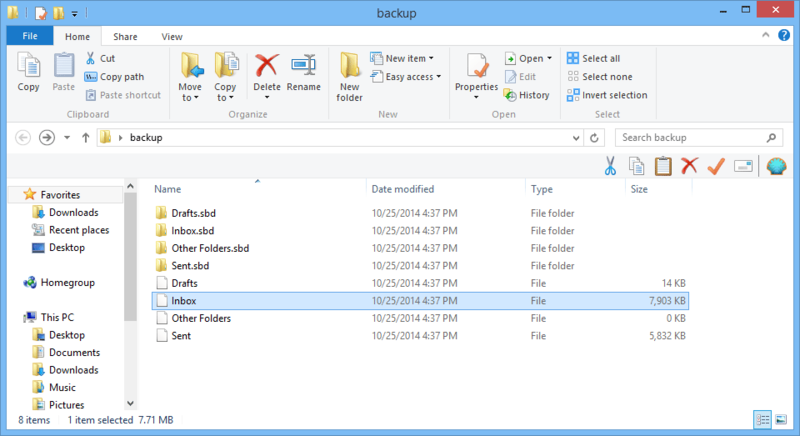 Add Folder: To add a complete folder containing multiple NSF files. Remove File: To remove added NSF file from the application. Choose the destination folder path for the MBOX file and click on OK.
As you click on the Export button, the tool will begin exporting selected NSF file to MBOX format and will display the following details like: Email Count, Folder Count, Migrated File, etc. When the process completed, the tool will display the message of successful completion. Click on OK button. 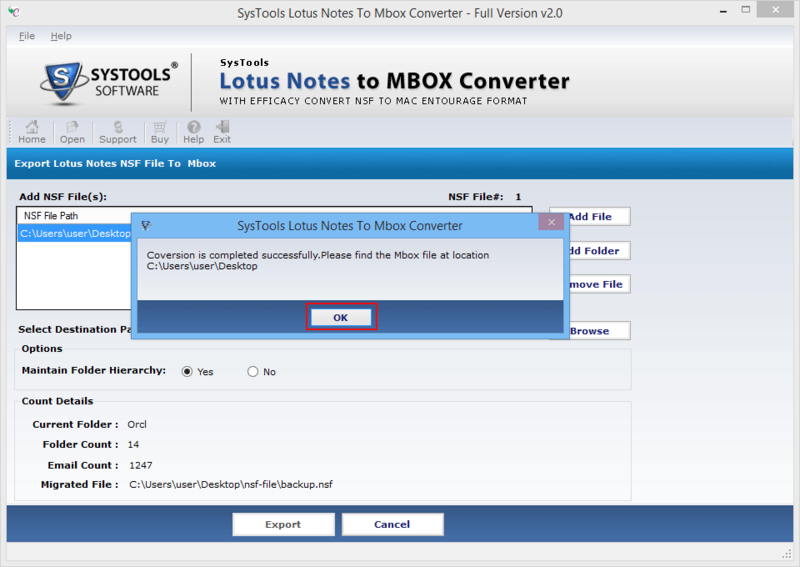 Navigate to the destination location selected at the time of conversion for storing the converted Lotus Notes to MBOX format. "The maintenance cost of Lotus Notes is really high, so I want to switch to some other email application. 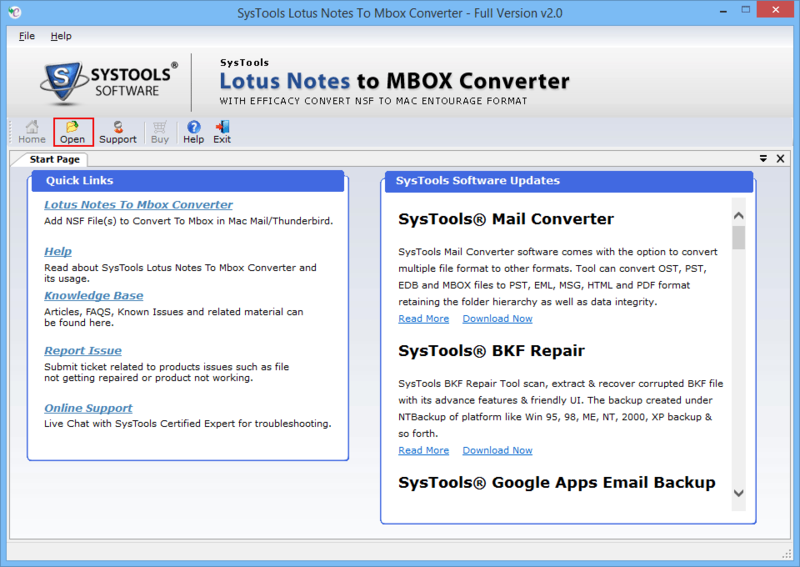 Therefore, searching for a solution to convert NSF File to MBOX format, which is supported by many email applications. Thanks to The SoftwarePro NSF to MBOX Converter for helping me out in this. This is an amazing and really simple utility that I have tried ever." "File conversion has always been a difficult task for me but when I used this superb NSF to MBOX converter I found it really easy. The user interface is so easy that it does not confuse users with so many features. I must appreciate the work done by the developer in developing such a great utility. Hats off to the developer team!!"